“This year in Jerusalem was originally conceived as a kind of scrapbook. I wanted to challenge myself to write short stories and very short stories, and to subtly connect all the imagery and characters so that a larger scene gradually evolves. After graduating from Cornell University in the spring of 2008, I was open to trying anything. I traveled first to Jackson Hole Wyoming, where I taught preschool. Later that year I moved back east to New York City. I crashed on a few couches and managed to survive the spiraling early days of the credit crisis by working as a host at a diner, substitute teaching and other odd jobs. By the time I set out for Israel in the fall of 2009, I was desperate for consistent work, and some calmer atmosphere. For $500.00 I purchased a one-way ticket, and arranged to serve as a kibbutz volunteer. From what you hear on the news, Israel hardly seems like a place to search for peace. Kibbutz and volunteer life, however, surprised me at every turn and I soon found the space I needed and plenty of inspiration to begin reflecting on the turbulent year that had passed. At the same time, it was the greatest adventure of my life. As far as my writing project was concerned, I had brought a number of characters with me to Israel who would later feature in my current work in progress, a thriller about a terrorist attack in New York. The scrapbook concept of This Year in Jerusalem, enabled me to experiment, and to flesh out my character’s back stories. I dove into their personalities, strove to experience Israel through their fictional eyes, and let the writing pour out. By the time I returned to the states a year later, to attend a master’s program at the University of Baltimore, I had written over 100 pages of raw, though colorful stories. My assignment for the next three years: edit, evolve, then, polish, and design my collection of stories for publication. I first approached Diana Muller in early 2012 about illustrating a novel that I had worked on as an undergraduate at Cornell. We planned to follow up our collaborative story, Mackerel, published on monologging.org, with a spectacular interactive multimedia presentation that would combine music elements, illustrations and writing to tell the story of a bluegrass band’s destructive journey across the United States in the wake of 9/11. This project ultimately proved too ambitious from both an organizational and a programming perspective. We had limited resources to support the musicians we hoped to involve in the project and the WordPress platform I was using to publish Monologging was inadequate. 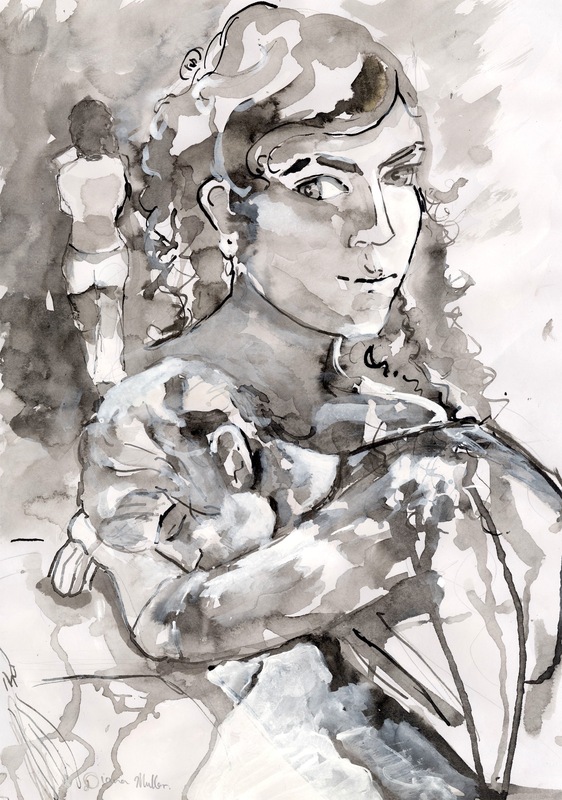 In the process of planning the interactive multimedia novel, however, Diana produced two amazing paintings (seen here) that confirmed her working style for the illustrations that were ultimately included in This Year in Jerusalem. 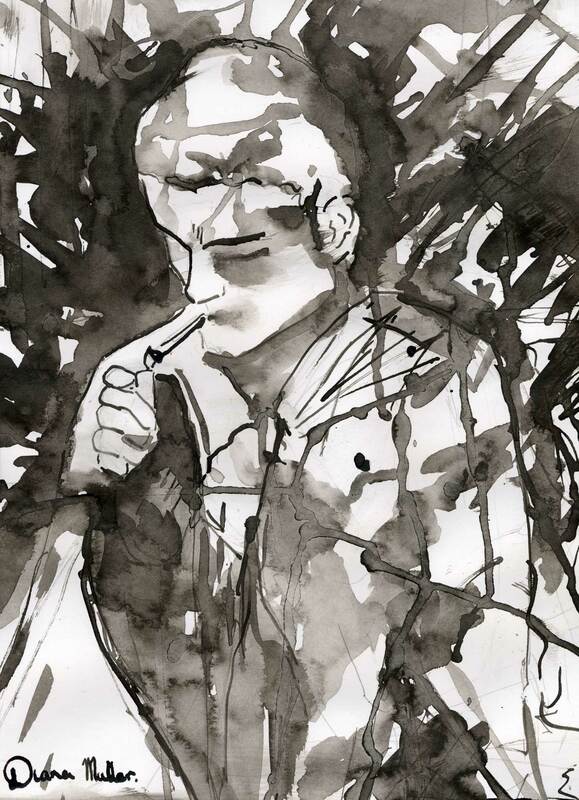 When she showed me her painting of the man smoking, I knew immediately that this had to be on the cover of my first book. We agreed to switch gears and produce a series of 11 illustrations to accompany the stories in my collection. For me, this effort at collaboration was essential. Diana, is a fantastic artist and a wonderful reader. It has been immensely fulfilling to have her read and illustrate my work these past two years and I couldn’t imagine the writing being published without her drawings. In a larger sense, I see incorporating her illustrations as the fulfillment of the promise of self publishing. Multi-media collaborations in many ways represent the future of literary reading and I’m happy to have a chance to work with such a talented artist and to integrate her work into mine creatively. In the end, This Year in Jerusalem is the story of two friends going separate ways for a while. The stories contemplate the complicated American relationship to Israel, both politically, and culturally, and also certain Jewish religious themes that enrich life in Israel. A short author’s note inserted at the end of the book explains how Diana and I first met and began collaborating despite the ocean between us. To read some of Diana’s thoughts on our final product please visit her blog.